Planning a sports event under the lights of a big city offers plenty of advantages to planners. The venues, amenities, and range of entertainment options, along with a vibrant sports culture, ensure that your event will be set up for success from the start. Indianapolis fits the bill for a sports planner’s dream destination. The facilities you’ll find in this bustling city are second to none, and with a host of professional sports teams calling the city home, you can be sure that athletes are in for the experience of a lifetime. The knowledgeable and qualified staff at Indiana Sports Corp are ready to help turn your dreams into reality when you choose Indianapolis for your next sporting event. 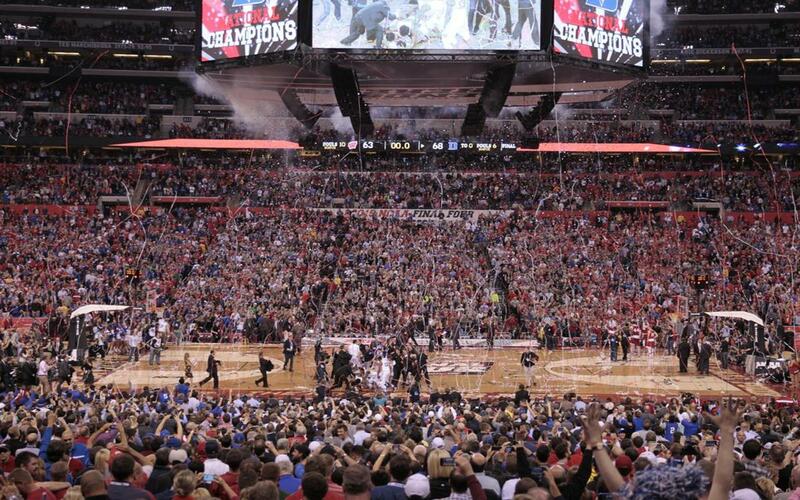 For sports planners who like to think big, Lucas Oil Stadium is the place to be. Recognized on a national scale as the host of Super Bowl XLVI and home to both the NFL’s Indianapolis Colts and the USL’s Indy Eleven, this is a venue with a reputation for quality at the highest level. Situated in the heart of downtown and with incredible city views, this state-of-the-art facility offers so much in the way of space beyond what you see on the field. There is seating for around 70,000 including 139 executive suites for added luxury, and seven locker rooms. In addition to the main field with overhead retractable roof, you will find 30,000 sq. ft. of flexible event space inside of the various stadium club lounges and 183,000 sq. ft. of exhibit space, so you can be sure that whatever you have in mind can be carried out inside this famed Indianapolis venue. To make things even more convenient, over half of the city’s hotel rooms are located within blocks of the facility, and Lucas Oil Stadium is connected to the Indiana Convention Center by an enclosed pedestrian corridor. Events at the Bankers Life Fieldhouse are always a good time, with some of the most enthusiastic crowds around. The arena is home to a few big names in sports, including the NBA’s Indiana Pacers and the WNBA’s Indiana Fever. It’s also played host to major events such as the Big Ten Men’s and Women’s Basketball Tournaments, the NCAA Women’s Final Four and the USA Gymnastics P&G Championships, so sports planners know it has a reputation you can count on. Whether it’s a high school tournament or a pro ball game, the Bankers Life Fieldhouse hosts it all. Inside the arena, which features a retro-style design, there is 750,000 sq. ft. of space for sports planners to make their dreams a reality. There are three public levels and two suite levels with seating for up to 18,000 (12,000 for ice hockey), along with concessions, locker rooms, a practice court, and so much more. The Fieldhouse is an iconic venue in downtown Indianapolis, and could be the perfect place for your next event. 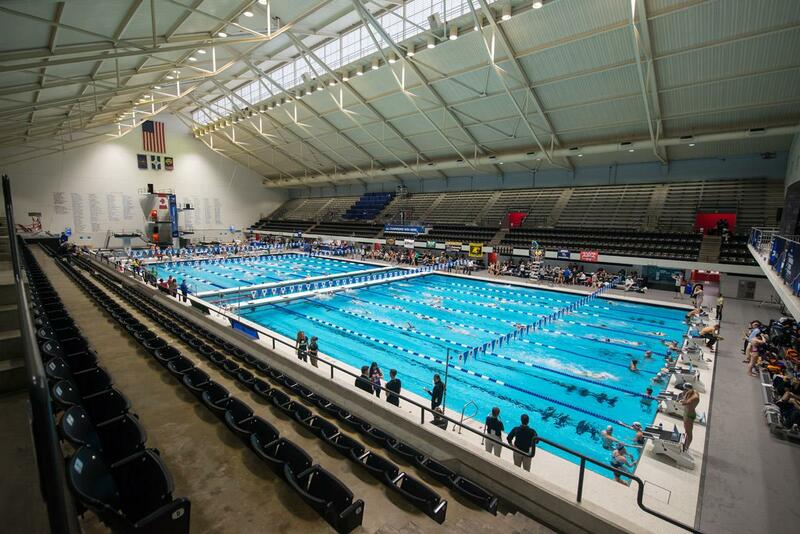 For nearly 40 years the IU Natatorium, situated on the Indiana University-Purdue University Indianapolis campus right downtown, has been an important part of the swimming and diving community not just locally, but regionally as well. The center has been a host venue for such major events as the NCAA Swimming & Diving Championships, NCAA Water Polo Championship, U.S. Olympic Team Trials for diving, USA Swimming Arena Pro Series and High School Swimming State Championships, all of which speak volumes to the caliber of the events taking place here. 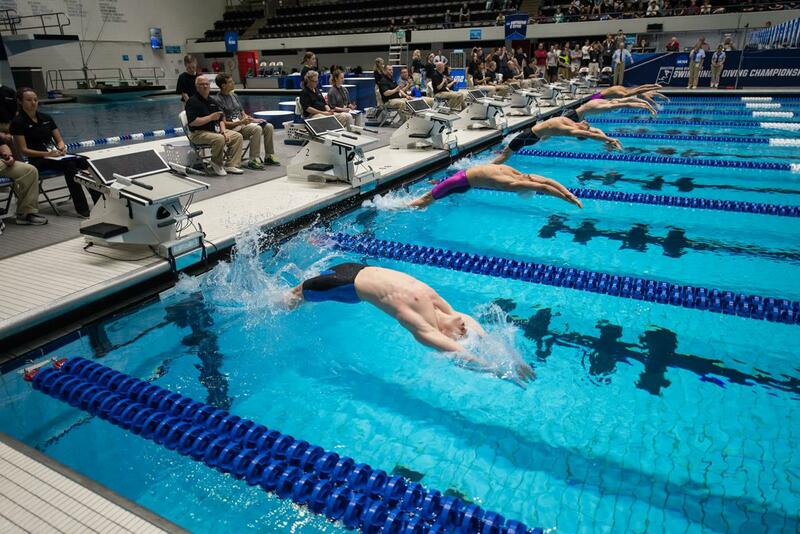 In fact, it is the largest indoor aquatic facility in the U.S., with a seating capacity of 4,700 (plus room for 1,500 on deck) and host of over 100,000 swimmers, divers, and fans each year. The main competition pool is 50 meters with eight racing lanes and contains six underwater windows for television and coaching analysis. In addition to the main pool there is also a 50 meter, 6 lane instructional pool as well as a diving well with depth of over 17 feet that includes four 1-meter and four 3-meter diving boards as well as 1,3, 5, 7.5, and 10-meter platforms. 101 American records and 15 world records have been set in this iconic pool. Convention centers offer sports planners unparalleled space to work with, and are perfect for a variety of indoor sports. The Indiana Convention Center, which has undergone a long list of expansions to become the massive, state-of-the-art facility you see today, is equipped with 71 meeting rooms, 11 exhibit halls, and three multi-purpose ballrooms. Over the years the center has hosted a huge variety of sports and events, notably the USA Gymnastics Junior Olympics National Championships, USA Volleyball, NFL Combine, and Big Ten Football FanFest. All of the facilities in the convention center are linked directly to the Lucas Oil Stadium for added convenience, space, and amenities. Racing fans are sure to recognize this famous venue, located just a 15-minute drive from downtown. The Indianapolis Motor Speedway is home to the world-famous Indianapolis 500 as well as the Brickyard 400, and has a powerful capacity – over 400,000 can be accommodated in the venue, making it the highest-capacity sports venue in the world. How’s that for spacious? The track is a 2.5-mile oval with 2 1,000-meter and 2 200-meter straightaways, and the entire venue sits on 559 acres that include seating, concessions, parking, and even a golf course. Every event that takes place at the Indianapolis Motor Speedway is high powered, high intensity, and full of action, so planning any event at this iconic venue is sure to be one for the books. Paralleling the Indianapolis Motor Speedway, Brickyard Crossing Golf Course is truly a course like no other. For a unique experience, sports planners won’t want to pass up a chance to host an event at this spectacular facility that sits in the shadows of the speedway and offers a unique view at every turn. Golfers will be meandering along holes that are a mix of fairway grass and speedway asphalt, hitting shots behind the grandstands and concessions. Whether or not you’re a racing expert, having the chance to play at Brickyard Crossing is a dream come true for many golfers. Four holes are inside the speedway while 14 are just outside, and is one of the few courses in the country to host LPGA, PGA, and Champions Tour Events. If you’re looking to get out on the water, there aren’t many places in Indianapolis that can compete with the Indianapolis Rowing Center. Located on Eagle Creek Reservoir, the center provides world-class facilities and programs to developing and seasoned crew athletes. It has been the host site of both the NCAA Rowing Championships as well as the Big Ten Rowing Championships and the Head of the Eagle regatta. The center is located inside Eagle Creek Park, which is home to a golf course, soccer facilities, beach volleyball, fishing and boating facilities. Over 400 events take place each year at the Indiana State Fairgrounds, all inside over 1 million square feet of event space that is as versatile as any sports planner could ask for. A variety of buildings and green space spread over 250 acres allows planners to custom design an event to fit the needs of athletes and coaches – whether it be a tournament, camp, game, meet, or any other number of sporting activities. If you can dream it, there is space to make it happen at the fairgrounds. In the past the grounds have been the host site of Indy Fuel hockey games and the NCAA Fencing Championships, with a long list of diverse events scheduled year around. We know that any sports event can be taxing for athletes, coaches, and chaperones alike, so why not spend some time outside soaking up a bit of nature right in the heart of Indianapolis? At the Canal Walk you can stroll leisurely along the waterway as gondolas reminiscent of Italy take riders effortlessly up and down stream, or you can even rent a boat of your own. The canal walk is popular among walkers, runners, and bikers, and leads from 11th Street to White River State Park, a 250-acre park on the edge of downtown that is a beautiful place to relax and take in the skyline views. Just across the pedestrian-friendly White River Trail from the park, you’ll find the ever-popular Indianapolis Zoo. Offering something for all ages, this a popular experience for coaches and athletes alike. Nearly 4,000 animals of more than 300 species live inside the park, including the red panda, the rhinoceros iguana, and the Chilean flamingo just to name a few. For those traveling with kids, the Indianapolis Children’s Museum is a surefire way to spark curiosity and keep kids entertained for hours on end. Engaging exhibits include as simulated dinosaur habitat, a carousel, and a steam locomotive, all of which are interactive and most importantly, fun. The museum’s Sports Legends Experience takes the city’s sports culture and makes it educational and interactive for kids, helping them to realize their potential through activities and drills coached by legendary sports characters that will have kids running, jumping, putting and more. For those in your group interested in learning more about the history of collegiate sports, check out the NCAA Hall of Champions in White River State Park. Two levels of interactive exhibits engage visitors and show them what it takes for student-athletes to truly become champions. You’ll find information on 24 NCAA sports and can take a crack at trivia challenges, view highlight videos, see artifacts donated from colleges, play on sports simulators, and much more – a perfect outing for any sports fan. And since we know you will have plenty of sports fans among your group, why not check out any number of professional sporting events while you’re in town? The NFL’s Colts, NBA’s Pacers, WNBA’s Fever, MiLB’s Indians, USL’s Indy Eleven, and the ECHL’s Indy Fuel all call Indianapolis home and their games bring sports action to the city year around. 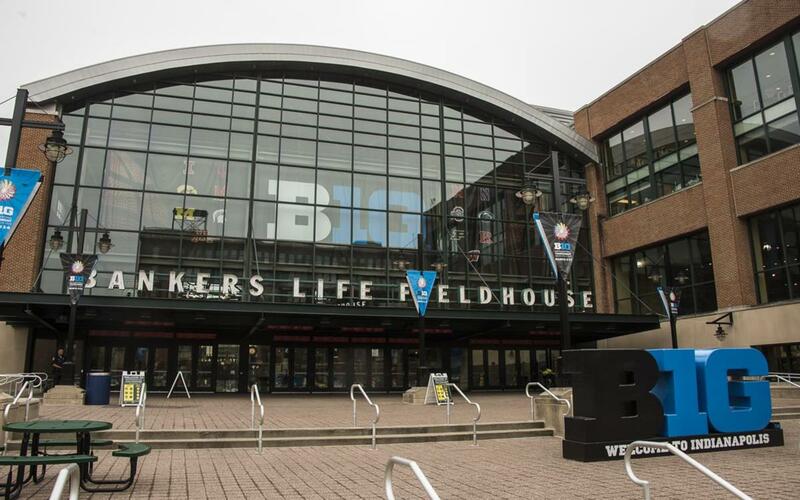 In 2019, some big events are set to take place in Indianapolis including the Big Ten Women’s Basketball Tournament, NCAA Division II Men’s & Women’s Swimming & Diving Championships, NCAA Division I, II & III Rowing Championships, and the Big Ten Football Championship Game, so be sure to check out what’s in town when planning your visit. Indiana Sports Corp, a not-for-profit organization, was founded in 1979 as the nation’s first sports commission. Early investments in premier events and venues, along with attracting major sports entities, solidified Indiana’s place in the world of sports. Now, we continue to build on our historic roots by growing volunteer, member and civic support while maintaining our status as a premier host in collegiate, Olympic-caliber and professional sports industries. By car: Major interstates I-65, I-69, I-70, and I-74 lead to and from Indianapolis in all directions. Chicago is three hours to the northwest and Louisville is two hours to the south along I-65; Columbus is three hours to the east and St. Louis just under four hours to the southwest along I-70. By plane: Located just a 15-minute drive from the center of downtown, Indianapolis International Airport offers direct flights all over the U.S. and to four countries. It is the perfect options for those traveling from further away or for those who enjoy the convenience of landing just minutes from downtown. Rental car options are also available at the airport, as well as a bus that regularly shuttles arriving passengers directly into downtown.